Recently, our client Zibitz Extreme Waffles opened for business inside the Mall of Louisiana. We took their idea and went to work on the branding. Here’s a look at some of the work we did. We are excited for Zibitz and can’t wait to see what new menu items they come up with next. 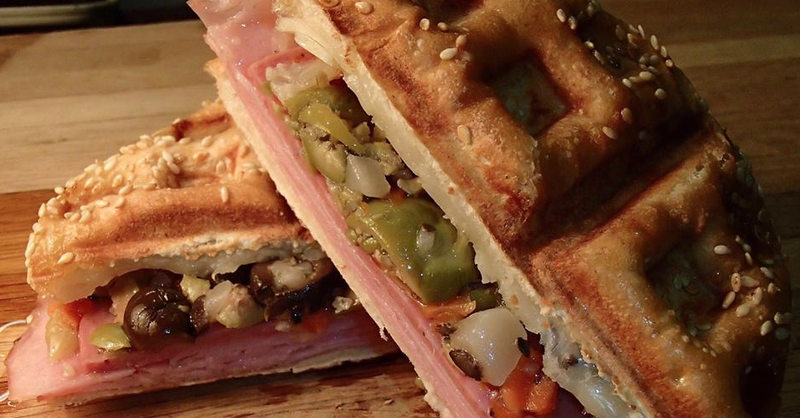 Yes, that is a picture of a muffaletta in a waffle. It’s called the Waffletta. Three local businesspeople are hoping Baton Rouge will get in on the waffle craze. Catherine Moore, Doug Felton and Chef Kerry Whitaker opened Zibitz Extreme Waffles last Thursday in the Mall of Louisiana. The restaurant specializes in fresh-made waffle sandwiches, sides and desserts, and is next to Smoothie King in the former location of French Fry Heaven. A quick glance at the menu might make your heart race. Zibitz offers everything from chicken and waffles to a waffle muffaletta or Waffletta (!!!). There is also a mac and cheese waffle, fudge brownie waffles for dessert, and the Liege—which is a sweeter Belgian waffle comparable to cinnamon bread. Overall, there are more than a dozen menu items as well as sides, such as a loaded waffle tato (think baked potato) and a tot waffle (tater tots). Moore, Felton and Whitaker all have worked in the restaurant business before. Moore spent time at Hollywood Casino, while Felton worked at The Chimes’ Highland Road location for 25 years. Whitaker previously worked as executive sous chef at Embassy Suites and executive chef at Hollywood Casino. Dishes range from $6-$9, and Moore says business is on the rise because of word-of-mouth response from employees at mall shops. For more information on Zibitz, check out the restaurant’s Facebook page.